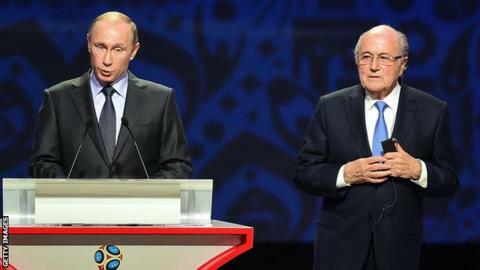 Former Fifa president Sepp Blatter has accepted an invitation from Russia leader Vladimir Putin to attend next year's World Cup. Blatter's 17-year spell in charge of world football's governing body ended amid a corruption scandal in 2015. Fifa subsequently banned Blatter from the sport for eight years, a term later reduced to six years after appeal. "I will go to the World Cup in Russia," said Blatter, 81. "I received an invitation from President Putin." Russia was awarded the right to stage the 2018 tournament in 2010, on the same day Qatar was controversially selected to host the 2022 event. Both countries were cleared of corruption allegations in the Garcia Report, published in 2014. But in September 2015, Swiss authorities announced Blatter was under investigation for a £1.3m "disloyal payment" to ex-Uefa boss Michel Platini in 2011. Both men denied any wrongdoing. He successfully appealed against an eight-year ban issued by Fifa's ethics committee to reduce the term to six years. A further attempt to appeal against the ban through the Court of Arbitration for Sport was unsuccessful. The World Cup begins on 14 June, the first edition of the tournament in Europe since 2006.